"Sampath Speaking" - the thoughts of an Insurer from Thiruvallikkeni: Blackberry banned by a Council !! – the row…. Blackberry is in news – due to Govt. It has been banned by a Council stating that it poses a risk to the environment. How outrageous !! – what will happen to the millions of its users ! Mistrust the obvious and never be presumptious !! The modern day e-generation is so wedded to gadgets. Push e-mail the facility of always-on capability where new e-mail is actively transferred to the user though it has to travel through a network servers. There are smart phones providing this and Blackberry tops the list. 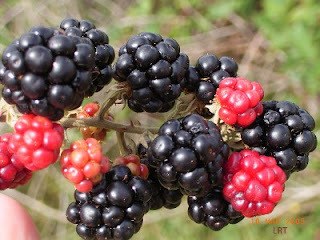 Much prior to the arrival of the saga of smart phones, existed the edible fruits of Rosaceae family also called blackberry... The fruit is not a true berry; botanically it is termed an aggregate fruit, composed of small drupelets. The plants typically have biennial canes and perennial roots. Blackberries and raspberries are also called caneberries or brambles available throughout the temperate northern hemisphere and South America. The searching for food is known as foraging. For ages, mankind has been foraging wild plants and animals hunting and collecting edible items. An appeal has been made to city's Court Leet, which has sat since the 14th century, to hear 'presentments' from citizens on matters of local concern, to clarify the legislation. The court has no power to punish but exists as a forum for citizens to air their grievances, which are then passed on to the council. A council spokesman said there were no laws which ban blackberry picking on the common but said that 'large scale blackberry or nut collecting would be inappropriate' if it damaged plants and habitat protected by wildlife legislation'. At the time of autumnal equinox, the nation's trees and hedgerows would burst with fruit, berries and nuts. This flourish is great news for the birds, insects, animals and also orchard owners, home gardeners and foragers. There would be places where fat red apples would hang heavy and road verges bound aplenty with ripened berries. All Nature’s bounty and autumn is the harvest time. The fruit or a mango that you can pluck direct from a tree would taste lot sweeter and better than the one you buy in the market or neatly packed in a super market !!. – that is not a steal but a great lure of getting the bounty direct from the Nature !! Elsewhere large numbers of BlackBerry (this time the mobile telephone) users across Asia, Europe, the Middle East and Africa were cut off from the internet and messaging services. India is estimated to have one million users of BlackBerry. The Canada based RIM acknowledged the disruption and stated that they are working to resolve an issue currently impacting the subscribers. Telecommunications companies in the Middle East and Europe laid the blame at the Canadian company's door. The extent of the outage wasn't clear. Across the affected regions, BlackBerry Internet access appeared to be sporadic. Some users were able to send and receive messages, while others using the same service provider couldn't . hundreds of users tweeted about the disruptions and reportedly companies like Qtel Qatar, Etisalat in the UAE, Dubai-based Du, Zain Kuwait, and the Bahrain Telecommunications Co. were facing disrupted services. Well, there are many who cannot live without instantaneous access to e-mails.